This ballad by the British composer and band leader Ray Noble has been popular since it was written in 1934. 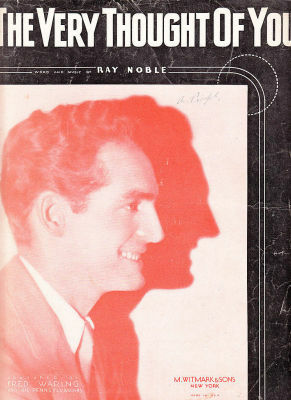 Noble recorded it with his own orchestra; Bing Crosby also recorded it that same year. Other significant recordings include those by Frank Sinatra, Carmen McRae and Nat King Cole. I’m happy as a king. “A Time For Love” was recorded in Fall 1965 and released in 1966 on the album A Time For Love. It was arranged by John Keating and featured Bobby Hackett on cornet. “The Very Thought Of You” was recorded was recorded in March, 2006 with Paul McCartney and was released that same year on Duets: An American Classic. It was arranged by Jorge Calandrelli. “The Very Thought Of You” was recorded in 2012 with Ana Carolina and released on the deluxe edition of Viva Duets.